2019 is the year for print advertising rather than digital advertising. Digital advertising is over-used and it's these times that old fashioned methods often work best. We have provided Customised Diaries to customers for over 15 years because they are remarkably powerful for exposing your brand-name, logo and contact details for the entire twelve months of the year. Our brilliant Customised Diaries are the perfect corporate gift to keep your customers organised and your company name in front of them 365 days a year! Choose the style and size you like best and we'll see that they all reach you ready branded with your business details and company logo. 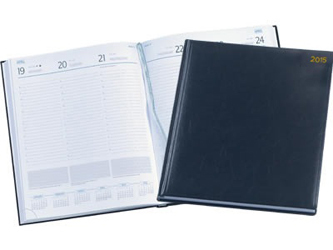 Your customers will appreciate the stylish giveaway and the Customised Diaries sitting on their desks will always be advertising your company details. You can make sure you have customer loyalty and at the same time, you can open the door to future business opportunities with relative ease thanks to the superior quality. 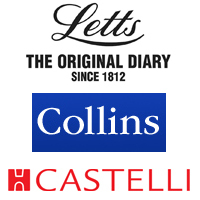 We provide Letts, Collins and Castelli diaries and they are prime advertising methods thanks to the available options; A4, A5 and A6 with day-to-page and week-to-view layouts. Choose the right layout and type of diary carefully before ordering a batch for your prospective clients. They are ideal to post to customers or had out directly; either in person or at trade shows.